The formation of Tropical Storm 11 (TS 11 – also known as Son Tinh, or Henry in the Philippines) had been closely monitored by the AHA Centre since early July 2018, as the team worked alongside the National Disaster Management Organisations of ASEAN Member States to prepare for the potential disaster impacts that may materialise should the storm continue to gain strength. Towards the end of July, TS 11 intensified, with torrential rains and strong winds buffeting a number of nations, including Cambodia, Lao PDR, Myanmar, the Philippines, Thailand, and Viet Nam, resulting in widespread flooding through many districts within these nations. 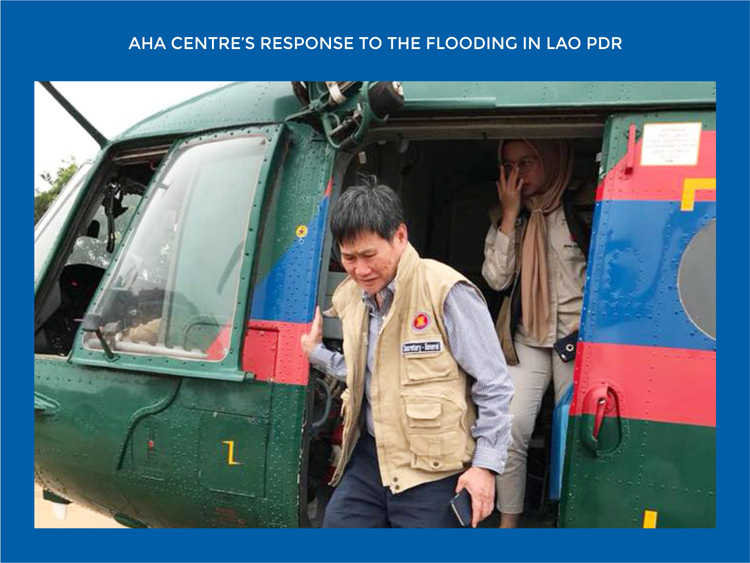 By the end of July, the AHA Centre was engaged in two disaster responses to flooding in both Lao PDR and Myanmar – which stands as the first time the AHA Centre provided support to two different ASEAN nations in unison. Floods were being reported across numerous ASEAN countries in the aftermath of TS 11. 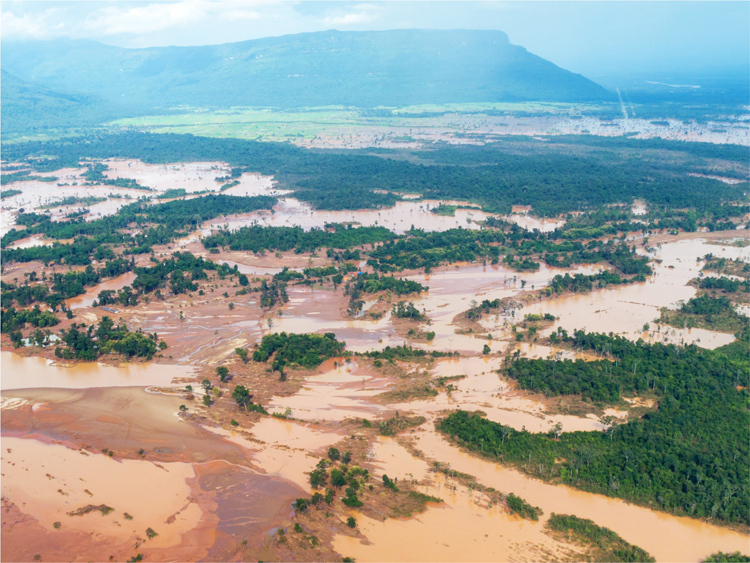 However, in the of evening of July 23rd, the walls of Xe Pien and Xe Nam Noy dams in Lao PDR burst, with flash floods impacting thousands of households downstream from the large water catchments. 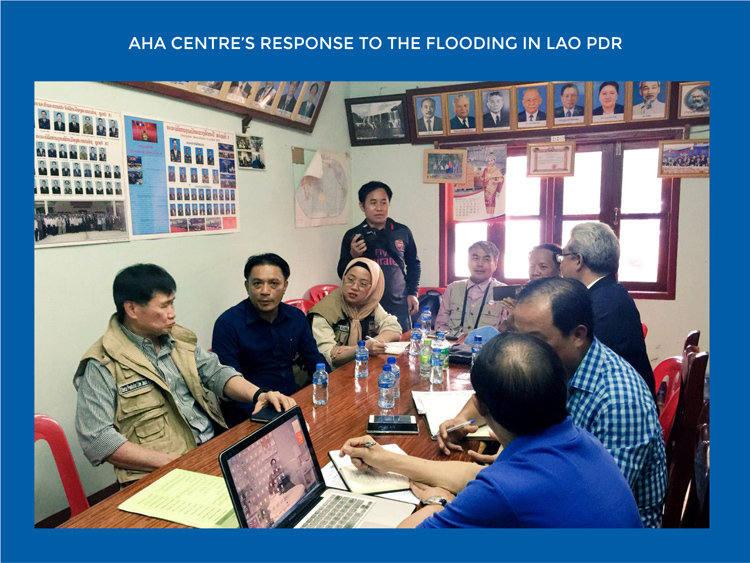 Within 24 hours, the AHA Centre’s Emergency Operations Centre (EOC) in Jakarta activated its emergency response operations, and an In-Country Liaison Team (ICLT) was deployed and arrived in Vientiane. 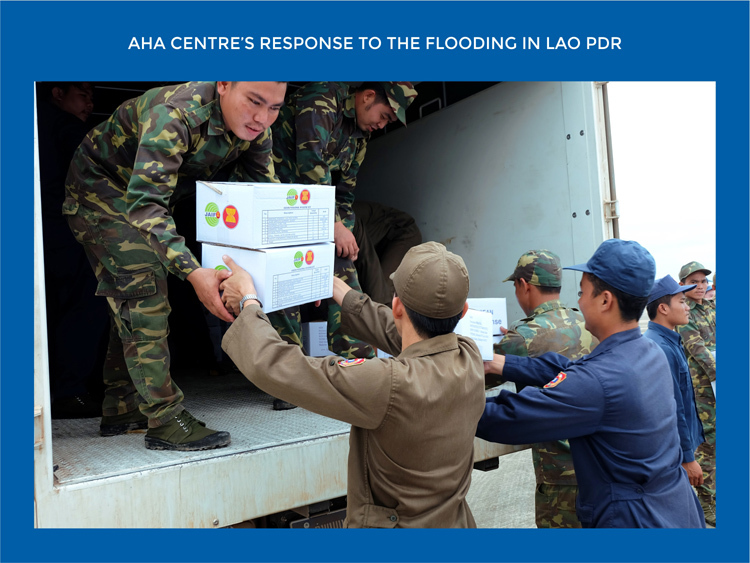 For this response, the AHA Centre provided four key aspects of assistance to the Government of Lao PDR and its people, including logistical management and coordination, information management and mapping, advisory support for operations planning, and finally mobilisation of relief items. 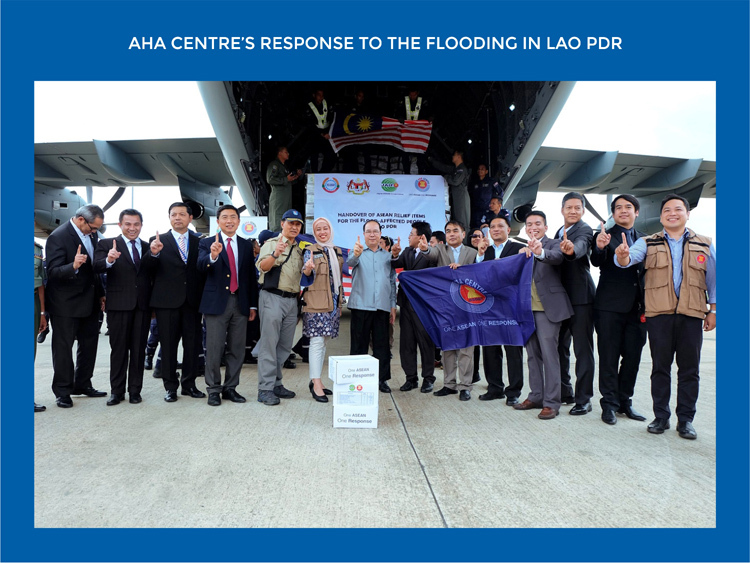 During the handover, the AHA Centre’s Executive Director, Ms. Adelina Kamal, stated that “The spirit of One ASEAN One Response is well-demonstrated in times of crisis, such as today. The swift coordination is enabled through continuous partnerships between NDMOs of all ASEAN Member States and our partners, built over the years under ASEAN cooperation on disaster management”. 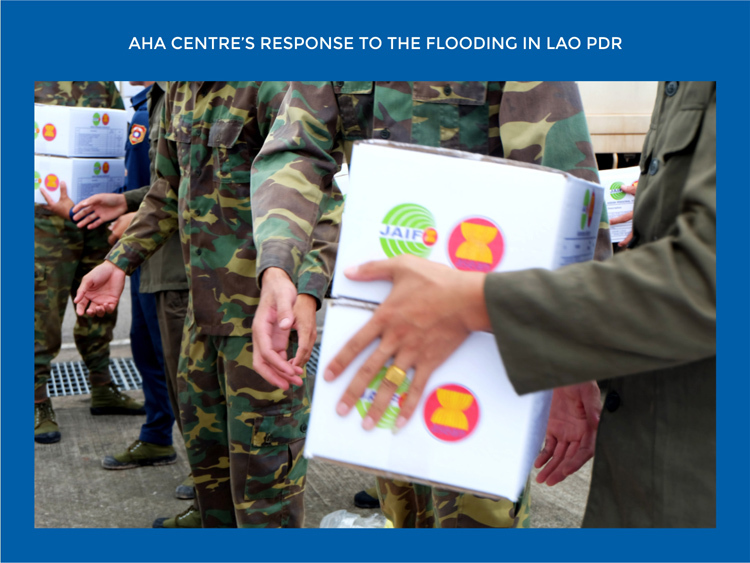 ASEAN’s relief items were delivered by the AHA Centre on both the 27th and 29th of July. The first batch included 1 alumunium rescue boat, 150 family tents, 2616 hygiene kits, alongside a mobile storage unit for use as a temporary warehouse for all incoming relief items. In addition, the National Disaster Management Agency of Malaysia (NADMA) also added to the assistance by providing an extra alumunium rescue boat. Whereas the first batch of relief items were flown-in to Wattay International Aiport in Vientiane, a second batch comprised of 3500 mosquito nets were delivered alongside Australian relief items, directly into Pakse Airport, Attapeu, one of the province’s hardest hit by the natural disaster. 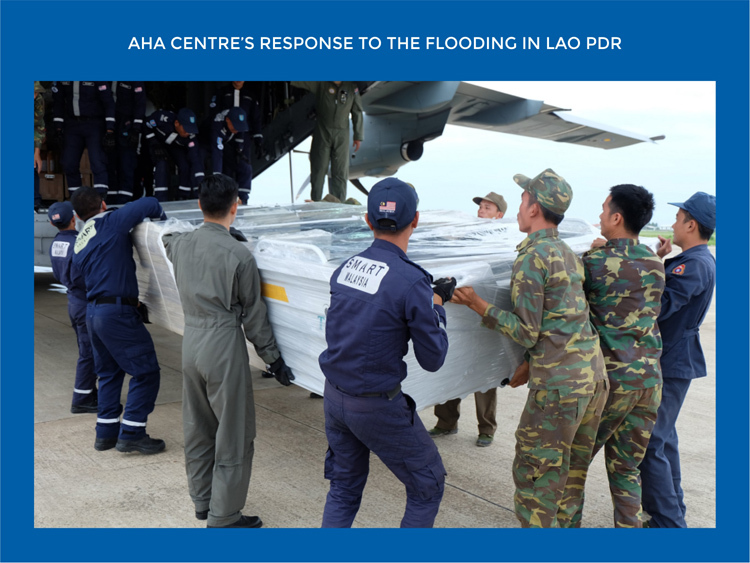 The mobilised relief items are crucial to the specific needs of Lao PDR’s NDMO, as well as the affected population. “When we found out that we had a serious disaster, like the dam collapsing, the first thing that came to mind was the AHA Centre. Emergency response is not only about mobilisation of funds, materials and food. We also need to learn about coordination for medical support, military cooperation, and camp management. I would like to take this opportunity to train people and learn how to organise, starting from the village level”, said Mr. Prasong Vongkhamchanh, the Director-General of Social Welfare Department of Lao PDR’s NDMO, during a briefing with the AHA Centre’s ICLT. Overall, TS 11 and the resulting flooding affected 10 out of 17 provinces across Lao PDR. On the 28th of July, the ASEAN Secretary-General – H.E. Dato Lim Jock Hoi, Deputy Secretary-General for ASEAN Socio-Cultural Community – H.E. Vongthep Arthakaivalvatee, the Director-General of Social Welfare Dept. 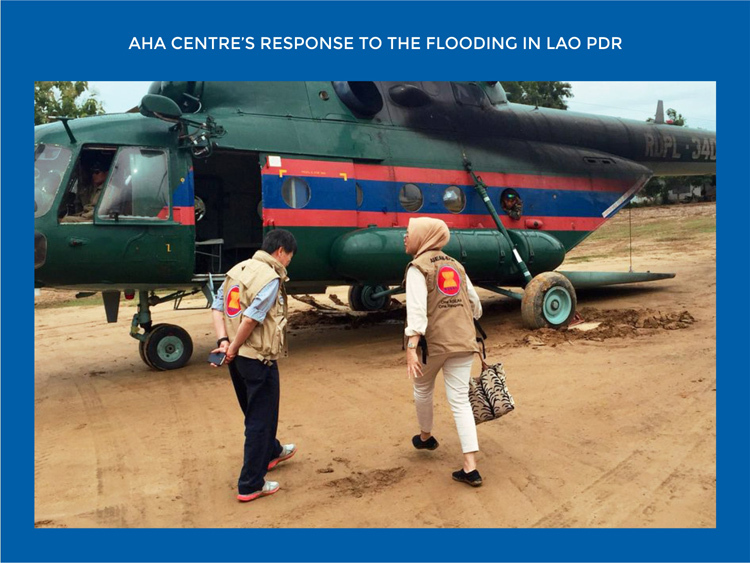 Head of NDMO Lao PDR – Mr. Prasong Vongkhamchanh, and the Executive Director of AHA Centre – Ms. Adelina Kamal, visited one of the severely affected provinces, handing over ASEAN’s assistance to the Governor of Attapeu and the Mayor of Sanamxay District. said the Secretary-General of ASEAN, H.E. Dato Lim Jock Hoi, upon his visit to Sanamxay. 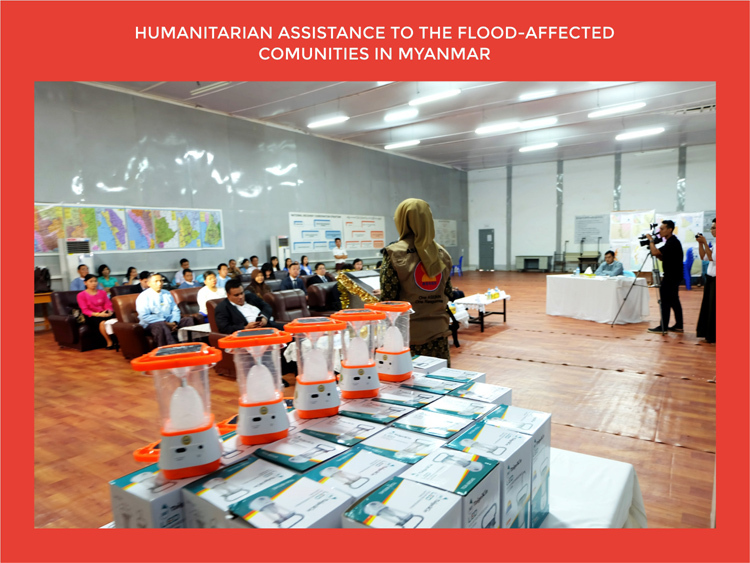 Before the mission in Lao PDR was concluded, monsoonal conditions in Myanmar saw the AHA Centre launch its second response on the 30th of July, to support the Government of Myanmar as nine regions/states were inundated by floodwaters, damaging homes and threatening lives in the central and southern states of the country. As conditions worsened, more and more of the nation’s population felt the brunt of the monsoon, with the Government of Myanmar reporting that more than 150,000 people had been internally displaced floods and landslides across nine regions, with the regions of Bago, Kayin, Mon, and Tanintharyi most heavily impacted. With many of the affected communities living in rural areas, a key issue highlighted was the limited electricity supply. 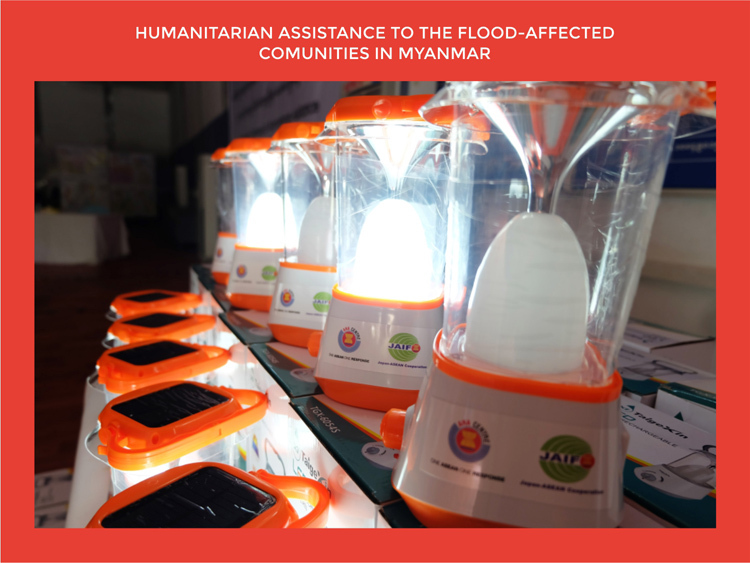 To address this, the AHA Centre provided 12,000 portable solar lanterns, procured locally at a value of approximately USD $79,883 that were then distributed to communities facing power outages throughout the flooded nation. 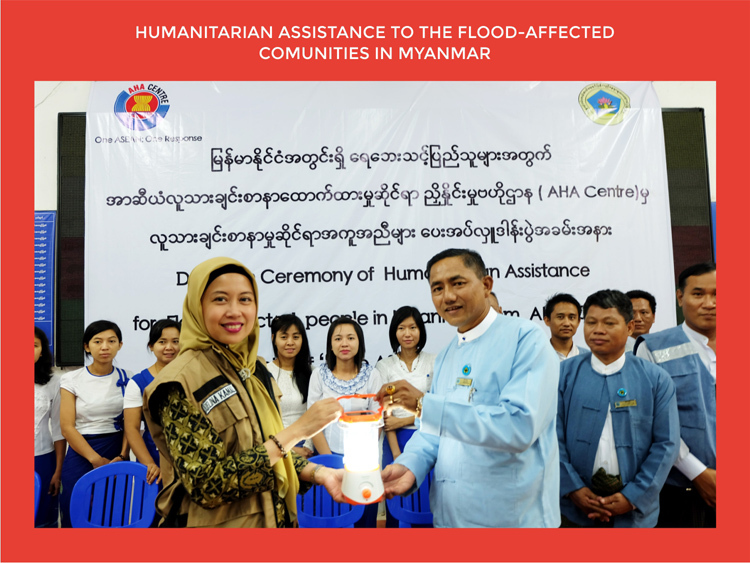 These items, alongside the provision of an In-Country Liaison Team to support Myanmar’s NDMO, displayed the solidarity of the ASEAN region as it provided disaster relief assistance, through the AHA Centre, to the communities affected by flood in Myanmar. The relief items were received by Mr. Win Shwe, Yangon Director of Department of Disaster Management, Ministry of Social Welfare, Relief and Resettlement Department, in Yangon, Myanmar on the 3rd of August 2018. 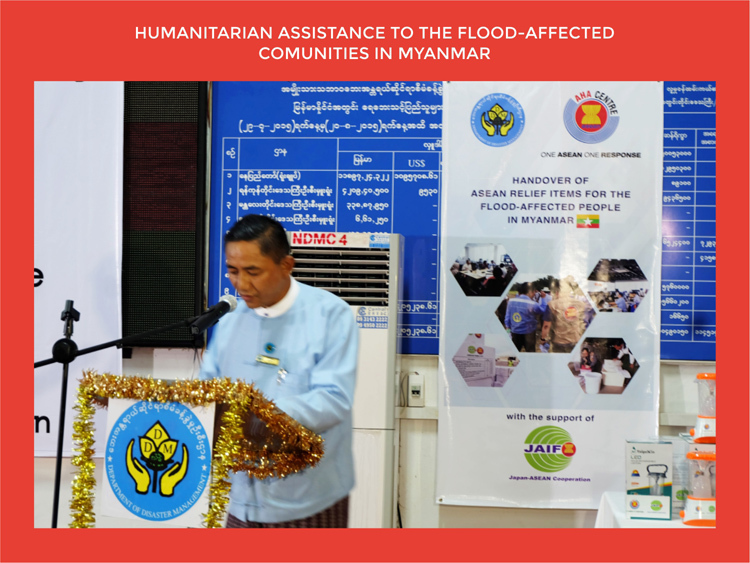 During the handover ceremony, Mr Win Shwe emphasised Myanmar’s gratitude by saying, “We would like to convey our deepest appreciation to AHA Centre for its readiness to support Myanmar. By taking this opportunity, we would also like to extend our personal thanks to the Government of Japan for its generous donation to ASEAN, through the Japan-ASEAN Integration Fund. This assistance will definitely signify the unity and friendship amongst the ASEAN Member States and would enhance mutual understanding”. The mission in Myanmar was concluded on the 4th of August 2018, with the overlapping responses forming the first time that the AHA Centre has activated missions to different countries at the same time. Although the ASEAN Emergency Response and Assessment Team (ERAT) was not activated for both responses, the AHA Centre managed to obtain the support of a Yangon-based ASEAN-ERAT personnel, who volunteered to help the AHA Centre’s ICLT during their mission in Myanmar. With less than 30 personnel, the AHA Centre also managed to gain ad-hoc support from various partners. At the end of its first ever in-unison response, the AHA Centre was already gearing up to support a Government-led emergency response in the earthquake-affected areas in Lombok, Indonesia, of which will be detailed in the next edition of the AHA Centre’s Column.